Spotting plantains with Liz and Beth in Tel Aviv’s Carmel Market was one of our most exciting, unexpected finds of the year. Plantains, which are indigenous to South Asia but popular throughout Africa, the Caribbean, and Latin America, don’t come up much in Israeli and Middle Eastern cuisine. And, while you can find Libyan, Yemeni, and Iraqi food galore throughout the country, Cuban restaurants aren’t exactly commonplace. Excited to purchase the plantains I bought two (yes, only two – what was I thinking?!) with no distinct plan but thoughts of frying them. Beth made some super awesome plantain chips with hers. Thinking about fried plantains got me thinking about Cuban food, which in turn had me drooling over memories of comforting, flavorful ropa vieja from some of New York’s fine Cuban restaurants. I knew I had to make a big pot of this rich stew to go with my fried plantains. For those who don’t speak Spanish, allow me to translate: ropa vieja means old clothes. Mmmmm. Appetizing, no? It’s because the shredded strips of beef somewhat resemble old clothes, or something like that. I had no idea that ropa vieja originated in the Spanish Canary Islands, as does much of Cuban cuisine (which is a unique mix of Spanish, Latin, Caribbean, African, and even Chinese). As usual, I did lots of research before diving in. My recipe is an amalgam of elements and tips that I gleaned from Bitchin’ Camero, Cuban Home Cooking, Epicurious, and the Food Network. This is definitely a lazy Sunday recipe, as it takes a few hours to cook as well as a few pots and pans. But the result is so worth it! The beef is simmered until tender enough to shred, and then mixed with tomatoes, garlic, red and green peppers, and the reduced braising liquid. Served with rice and fried plantains (any kind work here!) it’s a dish that makes you let out a sigh at first bite. Like any good stew, this comforting cuban dish takes a few hours to cook and is even better the next day. But it's worth every second. Put the beef, quartered onion, carrots, 5 cloves crushed garlic, and bay leaf in a large stock pot and pour the water over. Cook, covered for 1½ to 2 hours, until meat is very tender. Transfer the beef to a plate and loosely tent with foil. Allow to rest until slightly cooled, 5 to 10 minutes. Using two forks, shred the beef. Set aside. While the beef is cooling, strain the braising liquid, pushing on the solids, and return to the pot. Boil until reduced to about 1 cup, about 30 minutes. In a large pan heat the vegetable oil and add the sliced onion and green and red peppers. Cook until softened, about 10 minutes. Add the shredded beef, crushed tomatoes, oregano, tomato paste, 3 cloves minced garlic, and ½ cup of the braising liquid. Simmer until the beef is heated through, adding more braising liquid if needed. Serve over rice with fried plantains. Add the plantains so they are in one even layer. Cook in batches if necessary. Cook until plantains are lightly golden on one side, then flip. They should be slightly softened and evenly browned. Transfer to a paper towel-lined plate and season immediately with salt. Serve. Thanks Raymund! It’s actually not great for when you’re in a hurry as it takes 3 hours to cook, but it can definitely be made ahead! I bet it would be great in a crock pot as well. Oh my goodness! I just moved to Jerusalem from New York and I’m craving tostones (fried green plantains) so badly! I’m dealing with extreme morning sickness and can’t keep anything down. Its the only food I can think about without throwing up (sorry tmi) Were the ones you found green or yellow? Do you they sell them year round? Thank you so much! Welcome! Sorry to hear about your morning sickness :-/ The plantains I found were green and I have seen them year round, but only in Tel Aviv. I wouldn’t be surprised if you could find them in Jerusalem as well, though. There’s a yahoo group called “Israel foods” and most of the people on the list seem to be in the Jerusalem area; you might want to try posing the question of where to find them on that forum. Good luck! There are certain things which I believe I will never find at the grocers, but it is a delightful surprise when those ingredients show up unexpectedly! In reading your instructions on the stew, I am surprised that this only cooks for a few hours. That is a shorter amount of time than most stews, which does make it good for a weeknight meal. It looks tasty and comforting. Happy Monday! I know, I love finding surprising ingredients! When I started the rope vieja, I wasn’t sure how long it would take, although most recipes indicated that just 2 or 3 hours would be fine. I was pleasantly surprised to find that it was plenty of time to get the meat tender enough to shred. It’s still a bit of a stretch for a weekday, but as most of the time is hands off it’s really not too bad. Hope you’ve had a great week! Hi Katherine, lovely post. I bought a couple of plantains a few weeks ago and waited too long to do anything with them so I ended up feeding them to the ferns, LOL. I am going to pick up some more, this recipe is just what I want to do with. Thanks and have a wonderful week. Thanks Suzi! This is always my favorite way to prepare plantains, whether sweet or green. It’s so simple and delicious! Thanks for the reminder about the plantains! I bought a couple last week and I keep forgetting to use them. This sounds great together! You’re so welcome!! I love plantains so much and used to eat them all the time when I lived in the South Bronx. Enjoy yours! Cuban food is wonderful. I used to live in Tampa, and loved the Cuban restaurants there. And this dish? Terrific! I’ve never paired Ropa Vieja with plantains, but of course it’s a natural pairing – and one you often see on menus. (In any decent Cuban restaurant you can usually order a side of plantains to supplement any dish.) Good recipe – thanks. I know very little, almost nothing, about Cuban food, but I know I LOVE plantains! This looks delish! Me too! How wonderful that you lived in Venezuela. They must have the most incredible plantains there! Though I am familiar with plantain dishes but haven’t tried anything myself. This looks like a lovely meal. Very simple and delicious looking recipe Katherine! I love how you cook with these seasonings. I used to use canned tomato paste, which I hate to throw away or freeze using like 1 Tbsp but now I have a tube version. So that comes in handy for this kind of recipe. Looks yum! Very true Pola! And honestly most of the time is hands off so it really doesn’t feel that time consuming. I bet this would be a great job for a crock pot as well! I’d go crazy for the fried plaintains alone. I can never resist stuffing myself with those at my fave Cuban restaurant. I had absolutely no idea that that’s what ropa vieja meant! How funny! I don’t know what a plantain is. Maybe it goes by a different name here in Australia. I’ll look it up to find out. The dish sounds very interesting – lots of wonderful flavours there. Great images! This is a really nice dish to bookmark for the cold times ahead. I love the Cuban/ Sth SAmerican feel of it. We can get plantains here in Sydney ( Charlie Louie), and they are called plantains. Try stores that have a south american clientele or Fratelli fresh. Thanks Tania!! And thanks for confirming that you can get plantains in Australia and they are in fact called plantains 🙂 Good to know! I wish I could get plantains around here. I have to travel an hour for that. I love your pictures on this one! Oh no! That’s too bad 🙁 Well, the rope vieja is seriously good with or without plantains! 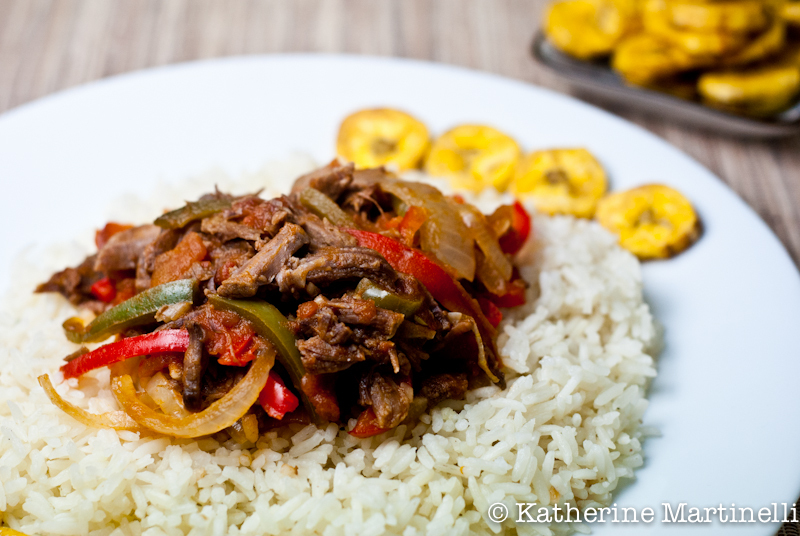 Slow cooked food can be so flavoureful, that ropa vieja looks so appetizing. i am glad too that I found your recipe since I needed a new beef recipe idea. banana chips remind me more of india, since they sell those everywhere even in the trains. Enjoyed the little info u provided us so nicely! thanks for sharing! Thanks Helene! I also love the flavors that come out from cooking food slowly. Banana chips totally remind me of India as well! Haven’t thought about those in ages. LOL…this looks nothing like old clothes 🙂 What a delightfully delicious meal…and I think I might be able to find plantains around here! I’ve never tasted plantains although they are popular here.. I love making Ropa Vieja … do the Venezuelan version as I lived there as a child, no green peppers and pulled very thin … I love … love this dish … I add fried (very mature) plantains … delicious and wonderful recipe! I don’t think I’ve ever had a Venezuelan version but it sounds delicious as well!! I love plantains and they are surprisingly easy to get in Spain too, thanks for recipe. The first time I had fried plantains was years ago when a woman from Puerto Rico made them us. They were delicious! So like you, when I can find them, I grab them. 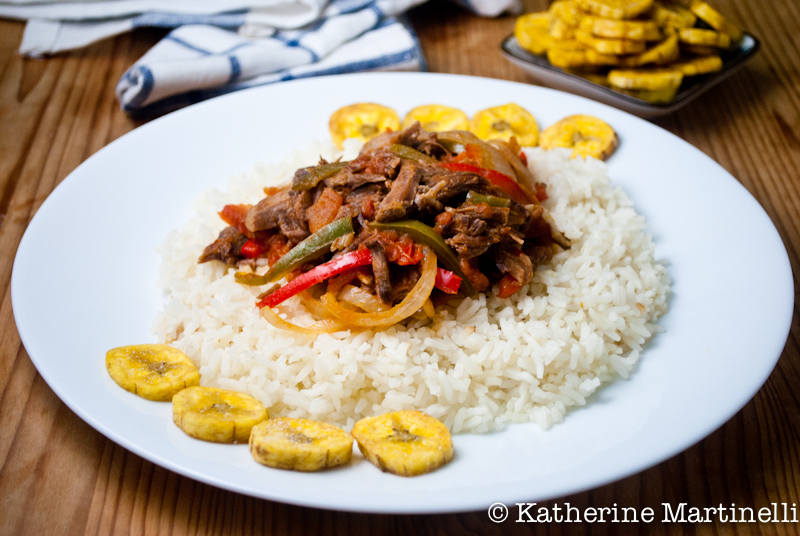 Your Ropa Vieja looks like a great complement with your delicious looking plantains! Great and beautiful plate of food! I’m in Tel Aviv and am looking for Plantains. Do you know where I can find them? Check in the Carmel Market! I found them at a stall towards the Yemenite quarter – if you’re in the main part of the market turn down the little street/alley by the Asian store and it’s on the next corner I think. You can ask around. Good luck!! Hi Katherine! Very excited to try!! I do have one question, if I cook in the crockpot do you recommend adding all ingredients at once? How long should I let it all cook? A lot of people might be throwing out plantains too soon. The outside can be black and they are still often good. Pull the skin back and see. The darker the skin, the sweeter and softer the fruit. If so how do you protect against it, aany plugin or anything you can advise?